This paper presents the results of some experiments on abrasive water jet of linear cutting into polyurethane foam panel. The abrasive water jet method can offer a suitable solution for manufacturing of polyurethane foam panel that are usually difficult to do. The main problem that occurs is the tapered shape of the linear cutting, due to the mechanics of the process and the control of the surface produced by the abrasive water jet. The experiments considered several values of the main process parameters like the feed rate and nozzle diameter that have a direct influence on the part cutting process. After measuring the parts, there were analysed the main dimensional parameters of precision to reveal the proper solution for obtaining the required quality of the process. In the case of centrifugally cast iron castings, the outer sand cores are used in order to obtain a gray cast iron structure that ensures good machinability. This is the case for the cylinder bushings for drive engines or the bushings used in oil installations. It is important to know the influence of the thickness of the outer sand cores on the solidification of these castings. A study is conducted on the influence of the thickness of the outer cores on the solidification conditions of tubular hollow cylindrical parts. The solidification time, the temperature distribution in the wall of the part, the cooling rate at the start of the solidification were analyzed. The study is performed by simulating cooling and solidification on the computer. The paper presents the results of an experimental study concerning the influence of centrifugal casting on the structure of castings from CuSn10 alloy. The cast parts were tin bronze bushings of exterior diameter Dex = 130 mm and wall thickness b = 25 mm. In the first part of the paper, the structure of parts gravity cast in sand and metal moulds is compared to the structure of centrifugal castings. In the second part, the influence of speed on the centrifugal castings is studied. This paper presents additional details regarding the quality of an 8 mm diameter drills batch, from HS 6-5-2 based on the electrical current at cutting measurement. The details have the purpose to complete the method presented in the specialty literature, and are useful for taking a decision with a higher accuracy regarding the quality of a drills batch but also for highlighting new aspects resulted from the electrical current at cutting analysis. The details refer to the choice of the processed material land confirm the usefulness of the method presented in the specialty literature. In addition, this paper highlight the connection between the drill corner and the electrical current at cutting. An actual issue is represented by the efficient utilization of the production areas. The literature of specialty sets at the disposal of the specialist methods and techniques of study and analysis of the production process. Even there is the theoretical support for the exact sizing of the production areas, of the emplacement of the machines and of the equipment and of the necessary facilities, rarely can be found complete solutions for the following up of valorisation of the built up areas. The existence of the land necessary for the construction of some areas of production, their designing for the developing of the industrial activities requires the existence of some important financial resources, which are amplified due to the recent evolution of the real estate field. As a result, it is an imperative an optimal valorisation of these areas. An overview of metallic nanoparticles' synthesis methods, using microorganisms, is presented in this paper. Among the most common nanoparticles, which have been reported to be obtained through biosynthesis in the presence of different microbes, silver, gold, cadmium sulphide, zinc oxide and titanium oxide are listed. The main characteristics of these nanoparticles are generally analysed by ultraviolet-visible spectrometry, X-ray diffraction, scanning electron microscopy, and transmission electron microscopy. The morphology and structure of the nanoparticles can be tailored due to the type of microorganisms (bacteria, fungi, yeasts, algae or actinomycetes), and furthermore due to the strain of each microorganism. Moreover, the synthesis process parameters, such as temperature, incubation time, solution pH, and the precursor molar concentration, can contribute to the change in nanoparticles' properties. The biosynthesized nanoparticles exhibit antimicrobial activity, and can be used for water treatment, cosmetics, catalysis and biosensor applications. This green synthesis method has gained interest lately due to the low-cost and environmental-friendly features. In this paper, on basis of scientific studies and analysis of the author, are examined the principle of action and characteristics of rotameter. Also is shown the procedure for calibrating the rotameter under certain conditions. There have been made some experimental studies on the determination of the calibration curve of the flowmeter. Circular economy is a new form of approach to the development of productive economic processes, arising from the aggressive resource consumption. The traditional approach for products in the field of environmental protection targets pollution prevention and waste management. These strategies aim only at preventing or minimizing the potential environmental impact, without considering the product design. Eco-design addresses the first stage in the product life-cycle, namely the stage of development. The new concept aims at eliminating the environmental impact from both product and manufacturing process. 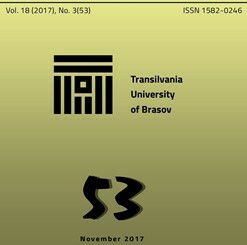 This paper presents the concept of circular economy, as well as the situation of the application of the circular economic model in the bearing companies with business units in Romania. Moreover, it intends to justify the need to pass to the circular model in the industrial bearing production, presenting the results obtained with respect to the consumption of resources, implicitly the emissions of substances detrimental to the environment (CO2 emissions) with a view to manufacturing and assembling bearings as products. The instrument used for this purpose was the Life-Cycle Inventory Analysis. The data presented in the paper are part of an ample study in regards to the susceptibility of fragile tear of a S.G. cast iron alloy with Ni-Cu-Cr, heat treated. The experimental data obtained from the experiments were analyzed with the help of the Chi-Square test for adjusting, in this case the analytic testing for the concordance of the distribution of the analyzed values with the normal distribution model. The specific steps for the calculus of the Chi-Square tests are presented and in the final phase by comparing the calculated value, χ2calc (8.0154) with the critical value, χ2crit (14.067) of the Chi-Square test, it follows that the condition: χ2calc < χ2crit is satisfied, therefore assuming that the distribution of the experimental data studied follows a normal distribution. The quality of potatoes chips produced in food industry is influenced by residual humidity and by quantity of Acrylamide produced during potatoes frying process on temperatures higher than 120 oC. Moisture influences the shelf life, and Acrylamide is a carcinogen substance. The temperature, the frying time and the thickness of the potato slice influence these two qualitative parameters. At the Transilvania University, specialized software was developed to simulate the process of potatoes chips frying. With this software, a study regarding the influence of all three technological parameters (temperature, frying time and thickness of the potato slice) on the qualitative parameters (humidity and tendency to form Acrylamide) of the potatoes chips was conducted. Based on the results, the recommended conditions for an optimized processing were established. One of the major decision which the manufacturing process designer must take in consideration, knowing the annual production volume and average volume of the batches, is the tuning of the equipment used for product quality inspection, which must be specific manufactured (specialized or modular) or with a higher universality. The approach of scientific technical-economic criteria of this decision is detail explored in this paper, by exposing the theoretical side and the case study. In the next pages, will be presented the choosing of quality product inspection using the total costs used for finding surface and depth machining defects for two of the methods used: inspection with ultrasounds and inspection with penetrant liquids. This paper presents an analysis of how information technology (IT) resources are managed by organizations, taking into account their current necessity and the importance of developing an IT system to carry out this activity. There are numerous applications that aim to inventory ICT resources, ranging from cost-free to very expensive. The main drawback of these IT systems is that they are primarily targeted at IT professionals. Commercial applications are powerful solutions for identifying hardware and software components but few are useful in a non-IT manager's current work. At the same time, these types of software use a specialised language, not always are made in different languages, and interfaces are mixed-up with irrelevant features not used by managers. It is noted that, from inventory point of view of, there are many commercial solutions but few can also be used in managerial activity. In addition, even a smaller part of them has facilities on ICT resource management at the employee level. Consistent with the ones outlined, there is a need for an application that presents inventory and management capabilities as well as making inventory records at employee level. The modern railway signaling systems currently used today are intelligent and automatic high-performance systems, for which the high level of reliability is required. However, there are many factors, including those uncertainties, which affect system reliability performance. In this paper, parallel system is further developed to increase the reliability performance of the system. Parallel system is a system in which components are connected in parallel and the system does not fail, even one component is in good working condition i.e. the system fails only when all components have failed. This paper provides a basic background into the types of redundancy that can be built into a system and explains how to calculate the effect of redundancy on system reliability. In modern railway signaling systems, the controllers provide the flexibility to create a variety of redundant architectures. For a design guide and reference architecture on how to build a redundant system. By using the proposed methodology, the results of reliability analysis indicate that the reliability of a signaling system can be assessed effectively and efficiently. In the case of cast iron parts centrifugally cast in metallic moulds, the thermal field in the casting is different from the case of gravity casting because it is affected by the rotational speed. In the case of the centrifugal casting of cast iron bushings for engines or for the oil industry, a grey cast iron structure is sought. This is for a good machinability of the castings. It is important to know the effect of various technological and geometric parameters on the solidification of these castings. One of the influencing parameters is the thickness of the casting wall. This paper presents the results of a study on the effect of the thickness of the wall of centrifugally cast parts on the solidification of hollow cylindrical castings, cast centrifugally and made of grey cast iron (in the case of gravity cast in sand moulds, grey cast iron sand solidifies with a pearlitic grey cast iron structure). The paper analyses centrifugal casting in metallic moulds coated with a 1 mm thick graphite coating. The effect of this parameter on the whitening tendency of the cast iron structure at the casting-mould interface is also analysed. The study is performed by computer simulation of the cooling and solidification of centrifugally cast parts. The development of new, innovative, cage-based solutions composed of a base material in which the walls of the pockets are coated with antifriction material that implies the need to carry out tensile tests, shock tests, and peel strength testing so that experimental product research focuses on potentially optimal features. The aim of the current exploratory research presented in this study is the testing of new composite specimens and the obtainment of dimensioning confirmation because the current standards indicate constructive solutions just for simple, monoblock specimens. In some cases, a number of disturbing factors can determine the redesign of specimens. The use of a universal machine to perform traction tests has determined the need for redesigning of the specimens due to deficiencies in the gripping system, which is implicitly designed for simple specimens. Even in cases where specimens need to be redesigned, the costs involved in carrying out the tests are reduced and the results obtained provide clear, future research directions. The localization method is used to control non-stationary linear objects. The mathematical model of the object is given by a transfer function with varying coefficients. This method was developed and studied in an analytical form. The advantage of this method is the effective suppression of the effect of changes in the coefficients of the object model on the stability and accuracy of the system. This is confirmed by the proved theorems for the differential equations describing the response of the system to the prescription change. These advantages are not applicable when control has the goal to suppress disturbance. However, this task is the most important one in automatic control practice. In addition, the system by this method has a static error. This follows from the structure of the regulator. In all practical problems, the provision of zero static control error is necessary. This requirement is more important than requiring of a small dynamic error. There are many publications devoted to the localization method and its application, but the provision of zero static error in them is hardly discussed. The present paper is devoted to the investigation of providing a zero static error, an external loop method with an integrator is proposed. The proposed solution to guarantee the reliability of the result and for the sake of clarity is illustrated by the solution of a numerical example. The solution is implemented using the software for mathematical modeling VisSim.